If this card is Xyz Summoned: You can Special Summon 1 “Photon” monster from your hand. While this Xyz Summoned monster is on the field, your opponent cannot target monsters you control with 2000 or more ATK with card effects, also they cannot be destroyed by your opponent’s card effects. Once per opponent’s turn (Quick Effect): You can detach 1 material from this card, then target 1 of your “Galaxy-Eyes Photon Dragon” that is banished or in your GY; Special Summon it. Starliege Photon Blast Dragon is a Rank 4 LIGHT Dragon XYZ with 1800 ATK and 2500 DEF and requires 2 Level 4 Monsters as XYZ Material. ATK is solid, DEF is great, generic materials is great as well, LIGHT and Dragon makes a great attribute/type combination. If this card is XYZ Summoned, you can Special Summon 1 Photon monster from your hand. 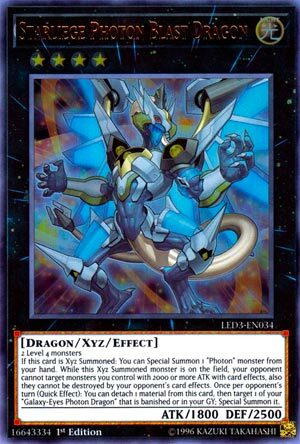 Photon Vanisher was likely used as XYZ Material for this, meaning it has that nice banishing whatever this destroys, but you will also likely have Galaxy-Eyes Photon Dragon in your hand to summon. It would of been nice if it could summon Galaxy monsters as well to get something like Galaxy Soldier or Galaxy Wizard out of your hand for them to search, but that’s fine. While this XYZ Summoned monster is on the field, your monsters with 2000+ ATK cannot be targeted or destroyed by your opponent’s card effects. Nice to protect multiple monsters that have good stats, it doesn’t protect itself though unless you control Hip Hoshiningen to boost this to 2300, but when Galaxy-Eyes Sol Flare Dragon comes in Soul Fusion, you’ll more than likely Link Summon that over Hip Hoshiningen. Once per opponent’s turn (Quick Effect), you can detach a material from this card to summon one of your Galaxy-Eyes Photon Dragons that are in the GY or banished. Nice way to retrieve your Galaxy-Eyes Photon Dragon for maybe another Rank 8 play or a Link play or just to have a 3000 ATK and 2500 DEF body on the field. Starliege Photon Blast Dragon is a good Rank 4 for Photon/Galaxy and is easily summonable in the archetype, so it is worth playing one or probably two of in the Extra Deck. Art: 5/5 I really like the Photon charged dragon here, better looking than Galaxy-Eyes in my opinion. Hard to believe we’re already in the last week of these Legendary Duelist cards. Opening the final week is Starliege Photon Blast Dragon. Light, Dragon, Rank 4, Generic XYZ Summon here, all good things to start. We notice the low 1800 attack for a Rank 4, but it is supported by a 2500 defense. So, the first trick we see, is that if you XYZ Summoned this card, you can Special Summon any Photon Monster from your Hand. We like this, naturally, a free Special Summon is never anything to scoff at. Next, we see this card protects all your Monsters with 2000 attack or more from being targeted and/or destroyed by your opponent’s card effects. I suppose that’s why this card couldn’t have 2000 attack, as it gets to protects others, but not itself. Which is a fair trade, understandably so. Finally, a once a turn Quick Effect, allows you to detach an XYZ Material from this card to revive your Galaxy Eyes Photon Dragon, so long as it’s removed from play. Interesting plot twist there, instead of the Graveyard, but it’s still welcome help. You either get one for a finishing attack (he does have 3000 attack after all) or you get a combo piece, likely for a bigger XYZ Summon. This card has plenty of support (that you knew of, and we covered this month) and is generic and easy to use in Galaxy/Photon Decks. Art: 5/5 Love all the cosmic backgrounds these cards, especially the Dragons, have. Happy Monday! This card has solid stats and effects. Starliege Photon Blast Dragon is a Rank 4 Light Dragon-type XYZ Monster with 1800 Atk and 2500 Def. It requires any 2 monsters to properly XYZ Summon this Dragon. However, 2000 Atk or higher would have been better because then its effect of protection on anything with 2000 or more attack would have included itself. If you can boost Burst Dragon then the protection from targeting and card effect destruction would apply. As an extender, you get to Special Summon a Photon monster from your hand if this is XYZ Summoned. You also get to use the quick effect during your opponent’s turn that costs 1 material to Special Summon a targeted banished or graved Galaxy-Eyes Photon Dragon. It’s a shame you can’t push for more damage with this one because the opponent would need to attack into it. If there were more Galaxy-Eyes names in the grave similar to Cyber Dragon, then this would/could be a better effect. Until then, Starliege Photon Blast Dragon should be run at 2 in Photon/Galaxy decks.